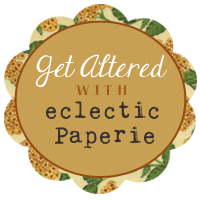 Eclectic Paperie: New Get Altered Challenge! I am challenging you to alter your mail! I received a brochure from a company selling work vans. I don't know what prompted them to send me this ( they must have seen me packing for a weekend crop!) but I was happy to alter it! If you don't receive any interesting mail to alter then go ahead and alter the exterior of an envelope or package to mail out - make the mail carriers day by creating something fun! Here is a look at the brochure as I received it. It is about 5 1/2" x 7" and came in the plastic sleeve you see. (I saved that not knowing whether I'll use it or not.) It has 5 double spread pages and 3 tabs and is made out of Kraft paper. My first step was to put Gesso on all of the pages. I did each one differently and apparently got so in to it I only took pictures of two of the pages (doh)! Here are the two I took pictures of. On the first one I spread the gesso on and then pulled some of it off with an acrylic stamp by CTMH. On the second one I applied the gesso through The Crafters Workshop Quatrefoil stencil. My next step was to put paint on all of the surfaces. I used Tim Holtz Distress Paints for all of them. Wetting the paint down good by spraying with water then moving it around with the edge of a credit card, bubble wrap, or just my fingers created a different effect on each page. By now the poor kraft paper and two lonely staples could no longer hold up to all the wetness. This was great because it made me think of creative ways to hold it together! So in addition to lots of Mod Podge I used different mediums down the centers of the pages. To add some more layers, I used my favorite stamp (Unity She Script) and my NEW favorite stamp (Wendy Vecchi Vintage Mesh) and punchenella with the new line of Wendy Vecchi Archival Inks on all of the pages and Christy Tomlinson Doodle Flowers rub-ons were used throughout. I left the cover fairly plain at this point because I really don't know what I'll be using this little gem for! It sure was fun and what a difference from the original brochure that came in my mail! I hope you'll join in the fun and alter a piece of mail with us! Link your project by Midnight Eastern on September 18th using the linky tool below and you'll be entered to win a $15 gift certificate to the awesome eclectic Paperie online store. I just found your store thru Teresa Jayes blog. I've just created a piece of MailArt. A MailArt postcard made out of a piece of cereal box. Will that work for the GiveAway? How cool is that ! I've often kept "interesting" mail pieces to use as inspiration for other projects... never gotten one like that... I love each page and what you did !!! This was a super fun challenge! I love what you created, Teresa! All that yummy texture!!!! And the colors! Beautiful work! Who would have thought...stunning alteration Teresa each and every page!! I`m going to be playing too it`s a brilliant challenge. Teresa, your project is very inspirational, so I came out of my comfort zone and made -mini tag book with old envelops. Just linked my project. thanks..
Wow Teresa, what an absolutely fantastic transformation! Stunning.